One conundrum after another. How many McFadyens does it take to change a light bulb? Only about six if they all have the same name and are in the same place at the same time! A Donald McFadyen came from Scotland to Cape Breton and received some land in the rear of Gut of Canso from the government. In 1825, as a single man aged 28, he petitioned to relinquish the land to his brother and take up a lot “between the Great and Little Harbours at Malagawatch.”(1) The request was approved. By 1826 Donald held a warrant for two such-described lots on Lake Bras d’Or. (2) We have to remember that a Crown grant of land was more than a one-step process. Final title to the land, the grant itself, would not be given until some settlement conditions or other obligations had been satisfied. Before that, transfers sometimes took place between individuals that may not be recorded. Two baptisms naming a father Donald McFadyen at “Merigowatch” appear in the Belfast, Prince Edward Island, Presbyterian register. (3) Son Lauchlin was born 5 June 1826 and daughter Catharine born 2 February 1828. The PEI clergyman visited Cape Breton once a year in the late 1820s until the area had its own incumbent in 1830 or shortly thereafter. At the baptisms, the mother of the two children was recorded first as Mary McLean and next as Mary Calder. The anomaly was apparently caused by confusion with Lauchlin McFadyen’s wife Mary McLean, a couple who were also having children baptized. We think this Donald died at Malagawatch on 10 June 1869 at the age of 77, registered by Alexander McFadyen. (4) Surviving Nova Scotia BMDs of the nineteenth century are scarce. It’s amazing to find one relevant to your research. We know this Donald had a son Alexander who stayed “at home.” Better (best!) yet, Donald’s parents were named as Lauchlin and Catharine. See the names of his first two children? So far so good? The single man of 1825 could have married and had two children by 1828. Let’s be clear this is not *my* Donald McFadyen the soldier of River Denys who arrived at Cape Breton in 1828. But the same-name syndrome entails a necessary exercise of separating their identities. And keeping them separate. For the time being I won’t go into the agonies of untangling statistics for two Donalds on the 1838 and 1861 (there is no 1851) census for Nova Scotia which are heads of households only. Enter Donald2 McFadyen, son of Donald the soldier, who was born in Coll, Scotland, ca. 1818. (5) His descendants—I am not one of them—say he moved to Malagawatch to take up a 188-acre lot. It’s pretty clear he thrived there, as a number of cousins independently confirm. The Crown land map shows another grant of 165 acres at Malagawatch with frontage on both Big and Little Harbours in the name of Daniel McFadyen. The relevant certificate no. 9030 has not been located yet. The 165 acres was almost certainly made to the Donald McFadyen who petitioned in 1825 to have land at Malagawatch. The description for him “between the Great and Little Harbours of Malagawatch” [italics added] is specific. There are only two lots in the vicinity that match this description. The 188-acre lot faces Little Harbour but has no access to Big (Malagawatch) Harbour. On the 1884 Church map of residents/occupants, both properties still have “D.” McFadyen on them. (8) The one between the harbours also has the addition of D. McFadyen Jr. on it. However, the early Donald did not have a son called either Daniel or Donald that we know of, whereas “our” Donald2 had two sons with those names. The 1865 Hutchinson Directory lists a Donald McFadyen, shoemaker, at Malagawatch. Hmmmmm. And I thought they were all farmers, according to census returns. Which Donald received which grant when? Who was the Daniel of the 165 acres? Were Dan’l and Don’l confused in English from the verbal Gaelic sounds? Where exactly did each one live? Who was “D. Jr.” later on? Did Donald of 1825 and his immediate descendants move elsewhere after 1836? The Donald McFadyen on Cape Breton before 1828 could only be from a different family—different, but perhaps still related in some way. (1) Donald McFaden, no. 3053, “Nova Scotia ... Cape Breton Island Petitions 1787-1843,” database, Nova Scotia Archives and Records Management (www.gov.ns.ca/nsarm : accessed 2 January 2009); citing NSARM microfilm 15799. (2) Murdoch McLeod, no. 3142, enquiry re two harbour lots at Malagawatch ‘for which Donald McFadden holds a warrant,’ “Nova Scotia ... Cape Breton Island Petitions 1787-1843,” database, Nova Scotia Archives and Records Management (www.gov.ns.ca/nsarm/databases/land : accessed 10 May 2008); citing NSARM microfilm 15799. (3) St John’s, Belfast, Prince Edward Island, Presbyterian baptisms, 1823-1849; LAC microfilm C-3028. (4) Donald McFadyen, death registration no. 32 (1869), Inverness County, Nova Scotia, Deaths 1868-1869; RG 38, vol. 50, NSARM. (5) Saint Lawrence passenger list (1828), RG 18, NSARM. (6) Maps 110 and 117, Eastern Nova Scotia [Cape Breton], Crown Lands Record Centre, Department of Natural Resources, Halifax. See also “Publications, Maps and Digital Products,” Nova Scotia Department of Natural Resources (http://gov.ns.ca/natr). (7) Index to Land Grants, Book 2, p. 62, NSARM; correspondence to author from Muriel Edwards, 25 January 1972. (8) Ambrose F. Church, Map of Inverness County, Nova Scotia (Halifax, NS: A.F. Church & Co., 1884). Hill of Crosses, Siauliai, Lithuania; photograph BDM October 2006. Speaking of Quebec’s Land Register (in Frasers Part 8), I knew my John Fraser the farmer had been on the Rivière Rouge Road outside St. Andrews, Quebec (St-André Est) since 1806. It was not until the 1861 census that I could find the property defined as lots 21, 22, and 23. Obviously, John or his sons had acquired two adjacent lots in the intervening 55 years. 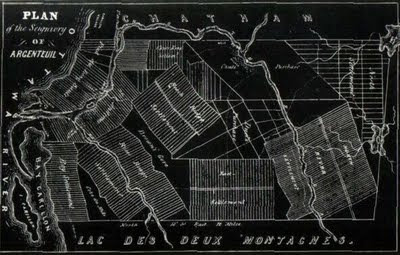 Map from Comte d'Argenteuil website. With that information, my colleagues in Montreal were able to determine that the cadastral numbers were 592, 593, and 594 in St. Andrews cadastre, division (circonscription) of Argenteuil. The determination itself involved consulting a modern cadastral map to pinpoint and compare with the old property description. As Gary Schroder put it, “We only need one cadastral number to unlock the mysteries.” Although the 1901 and 1911 censuses provide space for a household’s cadastral lot number, the enumerator simply wrote Rivière Rouge for my Frasers. Sharon Callaghan found the necessary map and copied the Index des Immeubles for each lot. Then she chose a few promising-looking sample document numbers to pull. Map provided by Sharon Callaghan and Gary Fraser from BAnQ, September 2009. Lot 594 is marked in colour. Lot 594 was probably the original family land. Document no. 26647 was a declaration made by Angus Fraser, farmer in the parish of St. Andrews, on 22 November 1911. In essence, he said that the land was in the estate of his late parents: his father James Fraser died about 30 years ago, and his mother Anne McMartin, widow of James Fraser, died about 20 years ago, both intestate. Their only and lawful heirs in equal measure were Angus himself, Alexander Fraser, Annie Fraser, Catherine Fraser and Elisabeth Fraser. Alexander died intestate and unmarried about three years ago; thus his brother Angus and three sisters were his heirs. The declaration was written and sworn by notary Gaetan Valois and registered on 12 December 1911. The next document of interest was registered on all three lots. No. 28757 was dated 23 November 1911 but not registered until 25 July 1914. Angus Fraser, Annie Fraser, Catharine Fraser and Elisabeth Fraser sold un droit de passage through their lands to the Canadian Northern Railway. The piece in question was a strip of land 100 feet wide, more or less following the River Rouge Road, for a price of $403.00 (piastres was the word used). This deed was drawn up by notary Joseph Evariste Valois of Lachute. • their late brother James Fraser Jr., no. 38950. I expect the more recent documents would give a more exact date of death for some of them, but I do know that most are recorded in St. Andrews East Protestant Cemetery. One thing I find surprising is that all of these people died intestate! A note made later in the margin of the register book indicates that certificate no. 9115B was made 1 December 1939 to record the deaths of Angus and Miss Annie Fraser. The documents are register copies, of course; original papers were filed with the witnessing notaries. The registry book in this case dates back only to the late 1800s, not far back enough to show any activity by my direct ancestors John the farmer or possibly his daughter Nancy. For that, seigniorial records for Argenteuil should be sought. Apparently they exist in the Montreal Branch of Bibliothèque et Archives nationales du Québec (BAnQ), but what kinds of documents they consist of, or what kinds of information they provide are unknowns. You can tell the end is not yet in sight.